Salinity of water refers to the amount of sodium chloride (NaCl), and other components such as magnesium salts, calcium salts, potassium sulfate and bicarbonate salts. Salinity is measured in g/L, or parts per thousand (ppt). Each shrimp species needs different levels of salinity. The requirements vary from time to time in its life cycle. Shrimp can adapt to gradual changes in salinity. When salinity is higher than 35 ppt, it will darken the color of water. High salinity also makes it difficult to adjust water color in shrimp pond. Black tiger prawn can tolerate a range of salinity from 3 to 45 ppt. The best salinity levels for black tiger prawn are from 15 to 20 ppt. Salinity fluctuation during the day should not exceed 5 ppt/day. If salinity is lower than 5 ppt, it is necessary to provide vitamins, vitamin C, and minerals in feed for black tiger prawn, especially for prawns that are over 45 days old. If salinity is higher than 35 ppt, shrimp will eat less, stop eating or grow slowly. Black tiger shirmp in larval stages (including zoea and mysis), postlarvae, juvenile and mature stages can live in water with a wide range of salinity. Whiteleg shrimp can tolerate salinity from 2 to 40 ppt. The best salinity levels for this species are from 10 to 25 ppt. 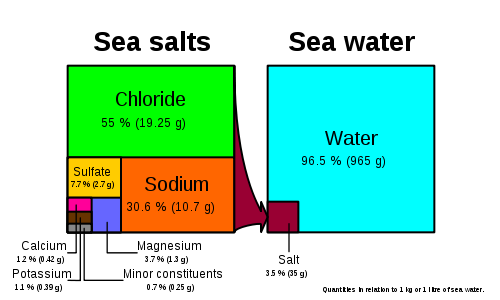 Seawater has a salinity of about 31-38 g/L (ppt). Salinity of seawater varies depending on the area, depth and temperature of the sea. The density of surface seawater is from 1.020 to 1.029.
pH of seawater is about 7.7 to 8.4.